In my humble opinion the Bauhaus and it off shoots are the root of all things ‘modern’. In the years from 1919 to 1933 the school developed a language for design of the future. The language has ebbed and flowed, changed and altered over the years but the underlying aesthetic is evident in everything considered and has been considered modern from that time forward. The first years of the Bauhaus were in Weimar, but when the political climate became unfriendly to the progressive ideas being generated at the school, the director, Walter Gropius up and moved the school to Dessau. Today our journey continues thru Dessau. Starting at the Dessau Employment Office. It was built to help people find jobs in a depressed time. Efficiency was the foundation for the way it was laid out. Interesting building with skylights so natural light could reach the depths of the workspace and covered bike parking for the patrons. It has been renovated over the years and adapted for different uses but is still for the most part intact. Next stop the Bauhaus. A building designed to house the school itself with some attached student housing, and space for a vocational school. This is the piece de resistance. Again I have seen pictures of the building for many years and the 3D reality is quite stunning. As we go through the building we get the idea how many times it has been changed and close to destruction. 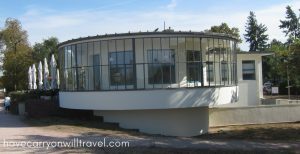 Yet in 1976 the GDR set out to restore the building, in 1996 the Bauhaus Dessau Foundation set about to restore the school to as close to the original as possible and even though there have been some concessions it is remarkably close to what it was like when originally built. Access to the building is actually quite limited unless you join a tour (which on the day we have there is in German) but it is still exciting to walk the halls and see the place. 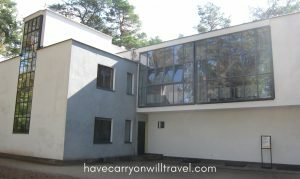 The masters houses are just a block or two away and are four stunning examples of Bauhaus design. Two of them were destroyed by the bombing raid of 1945 and have recently been reconstructed. 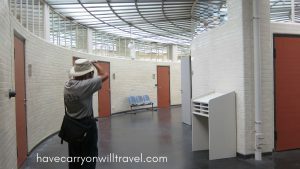 The are NOT as the original but are buildings that reflect the design philosophy and are set up to stage art exhibitions. As we approached I was quite taken but as we got closer I realized the windows are not windows but opaque glass for letting muted light into the interior. And when we got inside I felt it was a total letdown as the spaces were monolithic and not residential like what so ever. Frankly not worth the time. We go further down the row of house and the last five have been kept or refurbished to match the original buildings and contain some original furniture and some replicas of furnishings as they were in the 1920’s. This was truly mind blowing. The buildings and the way they are laid out could be any house designed and built today, 100 years after they were constructed. The furnishings are dated but the essence of today’s household is completely evident. I would move into one in a flash. This week is about the Bauhaus and today was the keystone in the journey. 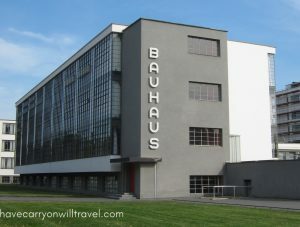 This entry was posted in Germany and tagged Bauhaus, Dessau, Germany. Bookmark the permalink.